O-sensei spoke of the six pillars of aikido: osae waza, shihonage, iriminage, kokyunage, kaitennage and ushiro. But on what do these pillars rest? As we work to define Great Ocean Aikido, I’d like to propose three “grounds” — aiki body, aiki physics and atemi jutsu — as a way of describing our approach to aikido. Aiki body refers to building the engine that is able to accomplish aikido. We were struck by Wayne Murray Driver’s question some years ago: “what if there is no such thing as good technique, what if there is just good posture?”. Since we started focussing more on developing our own stability and structure we have seen a marked change in our ability to practise kata “effortlessly”. Aiki physics is about understanding and employing a number of physical states. Primary of these is described by Danny James in the formula ɣΔF (gamma grad F) or “stepwise reduction of force”. This is the basis of the topple, reducing our partner’s power to zero. Incorporating modern physics and biomechanics has brought tremendous insight into how we can be authentically powerful without using strength. Atemi jutsu is the art of striking: where to strike, what to strike with, and how to use our bodies to greatest effect. We can use atemi jutsu to change violent conflict in our favour from the point of initial contact. 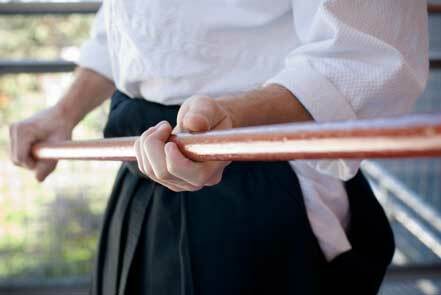 O-sensei is quoted stating that in real fighting situations 70% of aikido is atemi and 30% is throwing. Atemi was largely removed from aikido training in the post-war era. We are discovering just how much simpler aiki becomes when we add it back in. Of course there is a lot of overlap in these concepts and this is why there are three grounds on which the six pillars rest: it takes at least three legs to make a stool. ← Oak tree or bonsai?